Robert Sumner (Bobby) Stearns was born August 25, 1923 to Carey Sumner Stearns (1894 – 1966) and Betty Hunt Stearns (1896 – 1970) of LaPine, Deschutes County, Oregon. Older brother James Gerry (Jim) had been born a year earlier, in 1922. The Stearns were a farming/ranching family. Both of the Stearns’ sons served in WWII. Jim first became a flight instructor and later trained to be a turret mechanic and gunner on a B-29. Robert enlisted in the Army Air Corps on August 19, 1942. He trained to become a bombardier and was assigned to the 544th Bomb Squad of the 384th Bomb Group at Grafton Underwood, England on AAF Station 106 Special Orders #113 dated June 15, 1944 as part of the Larkin C. Durdin crew. Robert’s first mission as a bombardier was Mission #142 on June 21, 1944 to Berlin. By June 28, he had flown his last mission with the Durdin crew. After that, he served as bombardier on several different crews. In a letter to the Stearns family in January 1945, Durdin explained the reason that their son was flying with other crews was that Durdin had started flying lead, but Bob had not been checked out as lead. The Stearns’ local paper reported on August 26, 1944 that Robert had earned an air medal. Award of the air medal for “exceptionally meritorious achievement while participating in sustained bomber combat operations over enemy occupied continental Europe” to 2nd Lt. Robert S. Stearns, 20, Box 113, Lapine, was announced today. On September 27, 1944 on Mission #200, Robert replaced James B. Davis as the John Oliver (Jay) Buslee crew’s bombardier. Mission #200 was Robert’s sixteenth credited mission. On his seventeenth credited mission on September 28, Mission #201, Robert replaced Davis on the Buslee crew as bombardier for the second time. After coming off the target at Magdeburg, Germany, Lazy Daisy carrying the Brodie crew collided with Lead Banana carrying the Buslee crew. 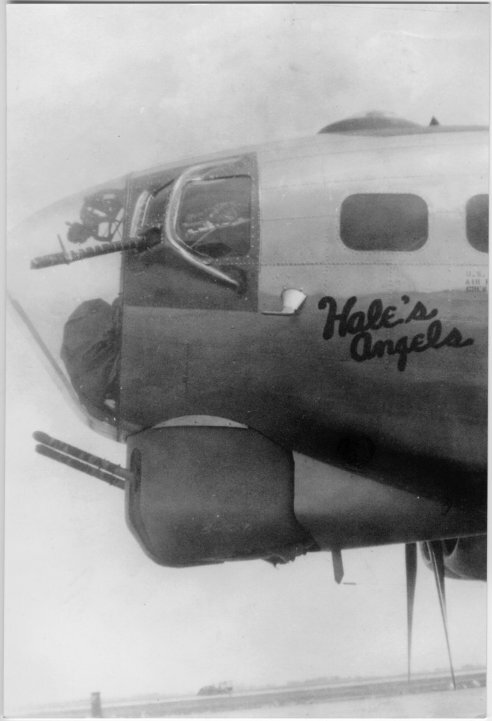 Of the Buslee crew, only waist gunner George Edwin Farrar survived. Robert and the other members of the Buslee crew were killed in the mid-air collision. The local paper announced that Robert was missing in action, article date unknown. Lapine, (Special) – First Lieut. Robert Stearns has been missing in action over Germany since September 28, his parents, Mr. and Mrs. Carey Stearns, Lapine, have been notified by the war department. Lt. Stearns, a bombardier, was a graduate from the Lapine high school. Classified as missing in action since the collision, the Stearns learned on December 23, 1944 that their son, Bobby, had been killed on the September 28 mission. The local newspaper ran an article regarding Robert’s death. Bend, Dec. 23 – Reported missing since September 28, in action over Germany, Lt. Robert S. Stearns, son of Mr. and Mrs. Carey Stearns, Lapine, was killed in action, his parents were notified today by the war department. Meager information received by relatives indicates that Lt. Stearns, a bombardier, was in a plane shot down only ten miles from Berlin. The young officer, a graduate from Lapine high school, went overseas last May. He was attending Oregon State college when he entered the service. Aside from his parents, Lt. Stearns is survived by one brother, Pvt. James Stearns, now at Fort Lewis. Marshall T. Hunt, Bend, is an uncle. 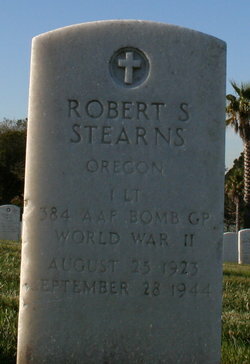 Lt. Robert Stearns was a grandson of Mrs. Frances E. Stearns, and a nephew of Harry and the Misses Lora and Nora Stearns, of Prineville. Robert Sumner Stearns lost his life barely a month past his twenty-first birthday. He was first buried in the cemetery at Ost Ingersleben, near the Lead Banana crash site. He was later buried in the U.S. Military Cemetery at Margraten, Holland in Plot “L” Row 12, Grave 299. 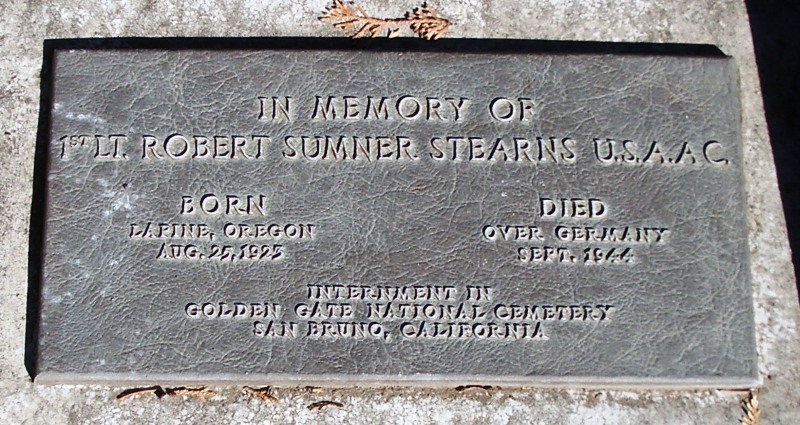 After the end of the war, Robert’s body was returned to the states and he was buried in Golden Gate National Cemetery, San Bruno, San Mateo County, California, Section B, Site 302. He also has a memorial marker in the Stearns family section at the Juniper Haven Cemetery, Prineville, Crook Co, Oregon. In determination of the fate of the two crews, eighteen total men, this report starts the count at eight (8) recovered dead, with only four (4) identified. An October 7, 1944 Captured Aircraft Report conveys the same information. 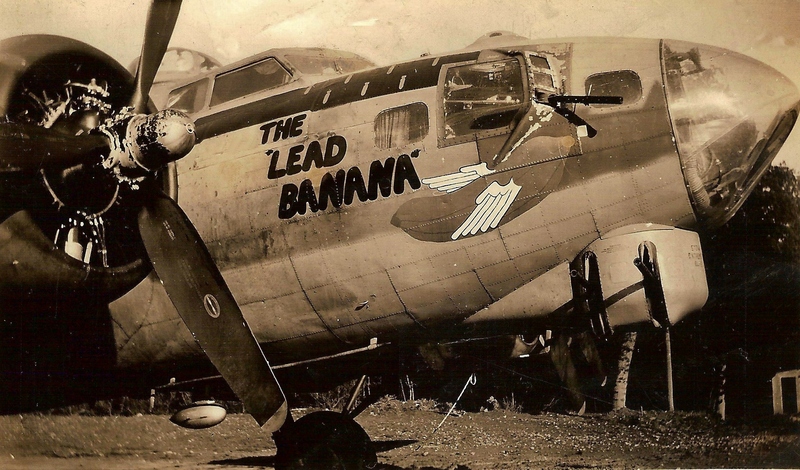 The aircraft could not be identified as the fire destroyed all markings, but it must have been Lead Banana as Lazy Daisy was identified through the tail number on the October 1, 1944 Telegram Form. What does the date of September 30, 1944 signify? Was this information received by the US Army Air Forces on this date? From who? What do the abbreviations in the “From,” “Through,” and “Remarks” sections stand for? This information can be found on pages 12 and 13 of MACR9753. MACR stands for Missing Air Crew Report. 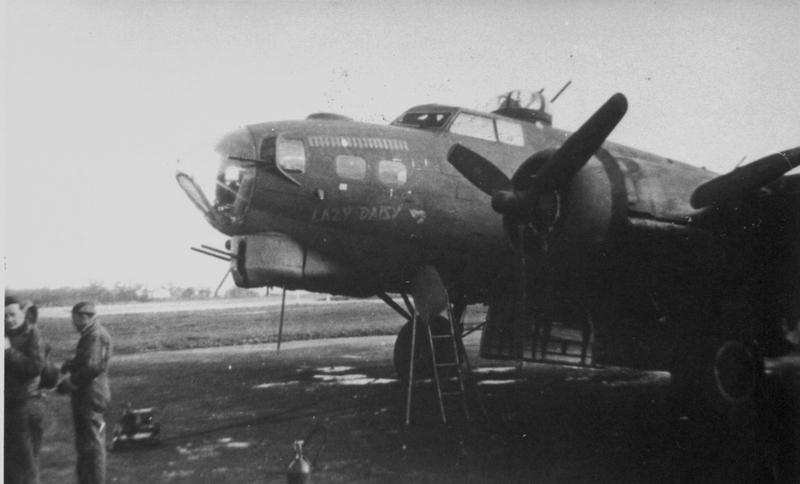 The B17-G aircraft with serial number 43-37822 was assigned to the 384th Bomb Group, 544th Squadron. Known as The Lead Banana, it completed 27 missions, returning safely to base on 26 of those missions. 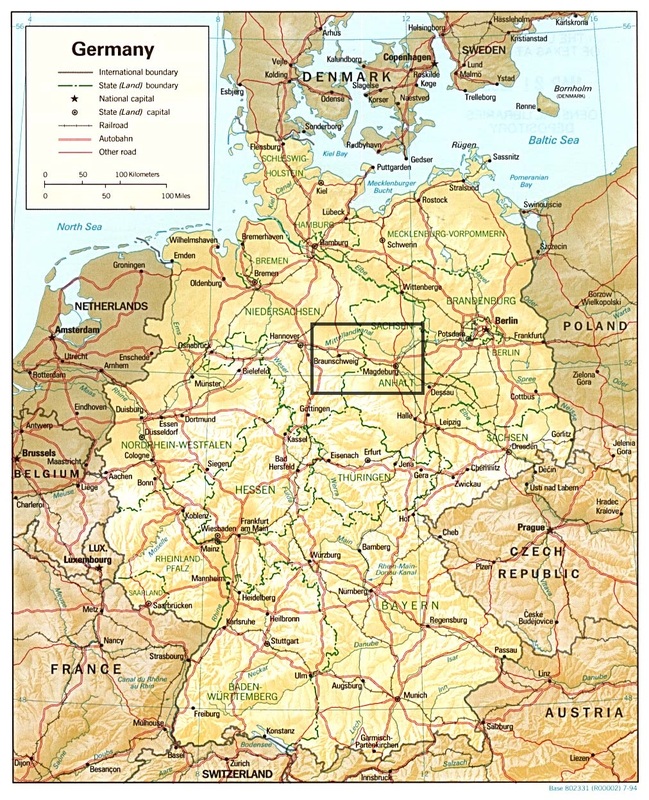 Its first mission, on July 20, 1944, was to an aircraft plant in Dessau, Germany. Its last mission, on September 28, 1944, was to a steelworks plant in Magdeburg, Germany. The crew was able to complete its assignment and drop its bombs over Magdeburg, but was involved in a mid-air collision coming off the target. John Oliver Buslee, David Franklin Albrecht, William Alvin Henson, II, Robert Sumner Stearns, Sebastiano Joseph Peluso, Lenard Leroy Bryant, George Francis McMann, Jr., and Gerald Lee Andersen, all aboard the Lead Banana, did not survive the crash. The only survivor, George Edwin Farrar (my dad), became a POW confined at Stalag Luft IV. Most of these men had flown on The Lead Banana on previous missions, but for George Francis McMann, Jr., and Gerald Lee Andersen, September 28 was the first and last time they set foot on this plane.